​We're back from our most recent trip, a visit to NYC for Laurie's Birthday! We spent 5 days in New York sight seeing, and spending time with friends. We had a great time seeing, socializing, and just going where the day took us! This is the second NYC blog I've done. There are so many things to do and see in NYC that a yearly trip doesn't get boring. 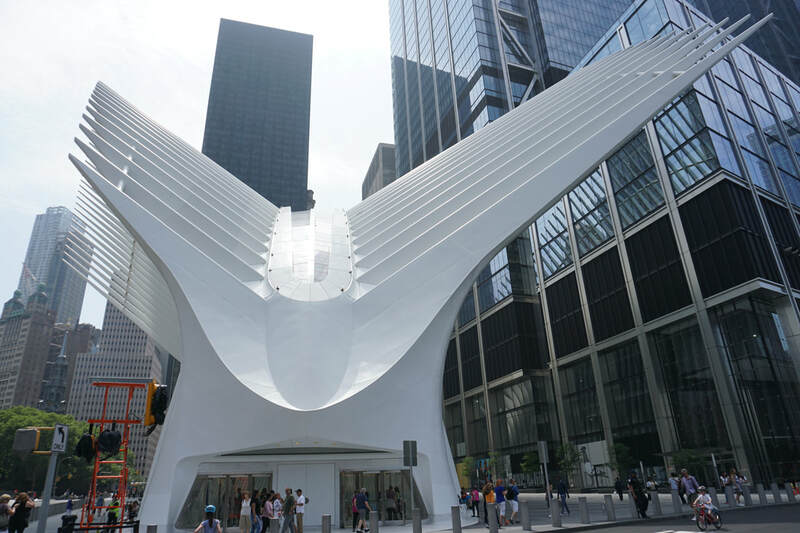 NYC is constantly evolving with new things to do and see. Outdoor movies, rooftop bars, new parks, new restaurants, and new things to explore. Every trip we take there is different. I've also found it nearly impossible to do a blog while there. We didn't get in bed before 1 a.m. the entire time. We would be out for dinner with friends each night and we would be enjoying it so much that time would just fly past. Doing the blog after returning home seems to work better for short trips to NYC. We seem to be too busy having fun! We started our trip on Wednesday June 20. I had a training session in Nashville and Laurie went with me and waited. When it was complete, we headed to the airport for our flight to NYC. We flew on Delta, and it was a direct flight. To make this even better, we flew on frequent flyer points so our flight was almost free! We had to pay something like a five dollar fee each. We flew into JFK. They have something called Airtrain now which is a connector train that takes you from the airport to the NYC subway. The cost for the Airtrain was five dollars each, and the subway is $2.75. This is by far the cheapest way into the city. A cab will run you over 60 bucks with tolls and a tip to Manhattan. We took the Airtrain to Howard's Beach. An odd thing about the Airtrain is that there is only one pay station. You pay when you get off the train when coming from the airport. You pay getting on the train when going to the airport. At the airport, you just board the train. When we reached the Howard's Beach station, we paid and we also bought our Metrocard. The Metrocard is your subway pass and when you enter the subway station, you swipe it and it pays for your train ride. We are going to be in the city for 5 days, so we get the unlimited rides for seven days ticket which costs $32 per person. If you ride the subway around a dozen times, you've covered the cost. I know we'll ride the subway many more times than that. 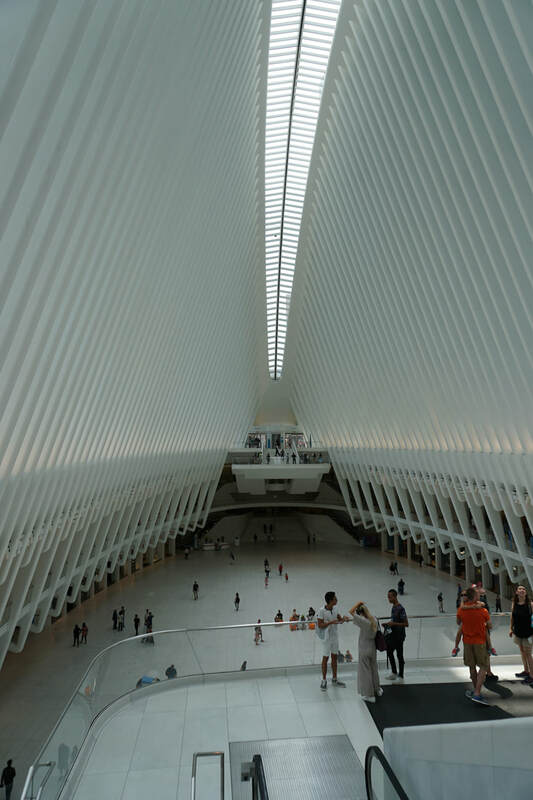 We take the train to the Hoyt-Schermerhorn stop in downtown Brooklyn and this is around a one block walk to our hotel . It couldn't have been easier. We got a deal at the Holiday Inn downtown Brooklyn and stayed there. The hotel is quite nice and pretty new. Clean, well taken care of, a pool, and a laptop safe in the room. 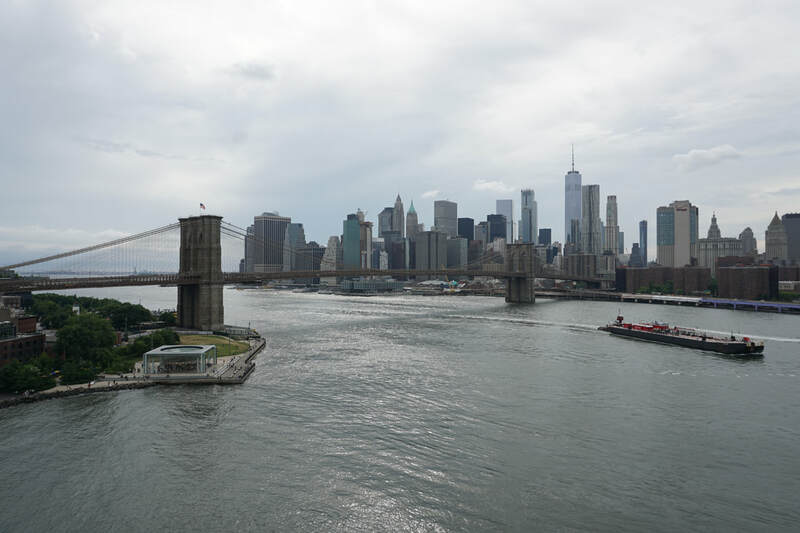 We know the area of Brooklyn pretty well and it is a very nice area with lots of restaurants, stores, and things to do. One of the most appealing things to me is there are 4 subway stations within a couple of blocks of the hotel. 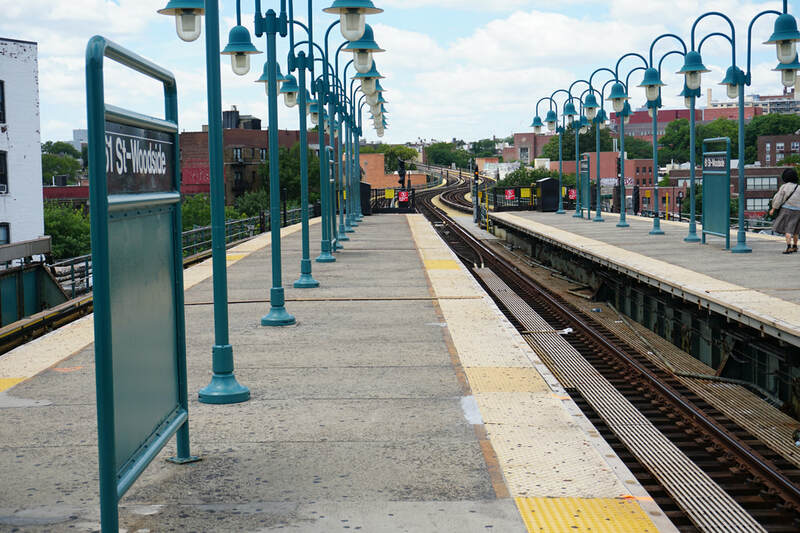 These four stations cover every line that comes through Brooklyn. We are hungry at this point and venture off at midnight to find someplace to eat. We love diners so we head for a nearby one called "Junior's". 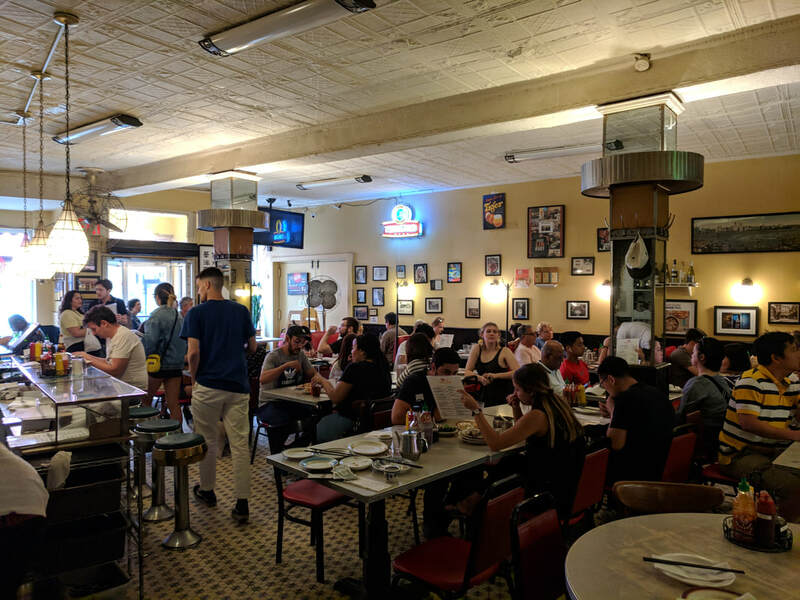 It turns out that Junior's is more than a little famous. We weren't aware of this but when people found out where we were by Facebook post or when we told them, we were always greeted with "that place is fantastic!" And for the record, it was. The food was great with bowels of pickles, pickled cabbage, and baskets of fresh rolls and cornbread brought to us as we ordered. I had ham and two eggs, which came with french fries. I think the two eggs must have been ostrich eggs as the pile of eggs was enormous. Laurie had a grilled cheese sandwich that was two inches thick, along with all the other trimmings and a glass of wine. While this was probably a 2000 calorie meal minimum, it was so tasty! We bought a few cookies for later from the on site bakery, and sadly had to pass on their famous cheesecake. You can only eat so much at one sitting. We are stuffed. ​We waddle off to bed in anticipation of our upcoming adventures. ​We start our day by rising late and heading towards Manhattan. We have lunch with friends planned so we skip breakfast as it's already late morning. We don't normally get up this late but we're on vacation! We have our metrocards, but decided to take a different path. NYC now has a nice ferry system! While not included on the metrocard, it isn't expensive. A ride anywhere on the system is $2.75 and you get a really nice view during your trip. We board at pier 1 in Brooklyn, right under the Brooklyn Bridge. The ferry travels up the river, under all the bridges, and stops at several stops in Brooklyn. It then crosses the river and we get off at 34th street. We start walking and pick up the subway that gets us close to where we're meeting our friends for lunch. Maria and her husband Bruce meet us for lunch at a great restaurant near where they live. Maria was a witness at our wedding and she has been a friend to Laurie since before I was in the picture, which puts it DEEP into four decades . We enjoy a decadent lunch with fantastic food, drinks, and desserts. The food was wonderful and we ate way more than we should have. We cap it off with a walk through Lincoln Center across the street. Bruce is a big patron of the arts and frequents many events in Lincoln Center. He gave Laurie a great tour and explained all the theaters and what events occur there. He and Maria live about a block away, very convenient for someone with a big interest in the performing arts. We hang out with Maria and Bruce for a while in their apartment, catching up on what has happened in our lives since our last visit. Bruce and Maria travel extensively in Asia, an area we haven't yet visited. We tell them about our latest trip and they tell us about theirs. It was great to see them again and we make plans for brunch and dinner on Saturday . We head out for our evening entertainment and take the subway down to Soho. I've told Laurie nothing at this point and she hasn't pressed the matter. All I told her was I had something planned and she would like it. We arrive at our destination, a book store called "Housing Works". At this point, I inform Laurie that I have tickets to an evening she will really enjoy. I finally tell her that we will be going to a live taping of "The Moth", a public radio/podcast show that she loves (www.themoth.org). The Moth is heard on over 460 public radio stations and stories are recorded from "story slams" that take place all over the world. There are 5 minute stories by ten different people. Storytellers prepare a story on the evening's theme (Technology is tonight's theme). Anyone who wants to tell a story fills out a waiver, and puts it in "the hat". The story tellers are drawn at random, and they get up and tell their story. The stories must be true, and they must be the story teller's personal story. They have to be real, and that is the most compelling thing about The Moth. You're getting a genuine story about someone's life. Some stories are funny, others touching, and some are tragic. No one ever knows what the story will be until it is told on stage, in front of hundreds of people. There were probably between two and three hundred people on hand. Maybe more. We sat and listened to the stories told. They are engaging and personal, and the people in attendance listen intently. We sat through stories about the lack of technology after the hurricane in Puerto Rico and how it affected everyone's life, stories about how technology brought people together, and stories about online dating and subsequent marriages. The stories were wonderful and we were truly enjoying the evening. As each storyteller left the stage, they or someone else would draw the name of the next storyteller. We sat and listened through seven stories. They drew out the name of storyteller number eight and read the name to the audience. When the name was said, I handed my camera bag to Laurie and said "I'll be right back". I stood up and walked to the stage. Laurie was totally unaware that not only had I brought her to The Moth, I had also prepared a story to tell. Tonight, I stood on stage in New York City, in front of several hundred people, and told a story. It was a good story, and it was greeted with much applause. I was also the only storyteller that had the crowd stomping their feet. I was honored to find my story so well received and so thoroughly enjoyed by the crowd. Laurie was so surprised that she didn't even think to take a photo of me on stage. We leave the venue and asked a group of college students who were at the show if they lived in the area and could recommend a place for pizza. They immediately begin complimenting me on my story and telling me how much they liked it. Once again, I was humbled. After chatting a bit they told us where a great pizza place was. We thanked them and we went to grab a slice. We walked a few blocks and found the pizza place, which had a line out of the door. While standing in line, we were recognized by another of the storytellers from tonight's event. I told her that she told a good story and I was once again humbled by her, telling me how wonderful my story was and how she connected with it. We got our slices and sat in a nearby doorway and enjoyed wonderful New York pizza. It's been a hell of an evening......and we look forward to our next day. New York City is under construction....they are building everywhere. From high rises to hotels, they're building it. They're also doing maintenance on streets, sidewalks, and especially the subway. From what I've read the subway needs a lot of infrastructure repair, but we had no problems when we were there. 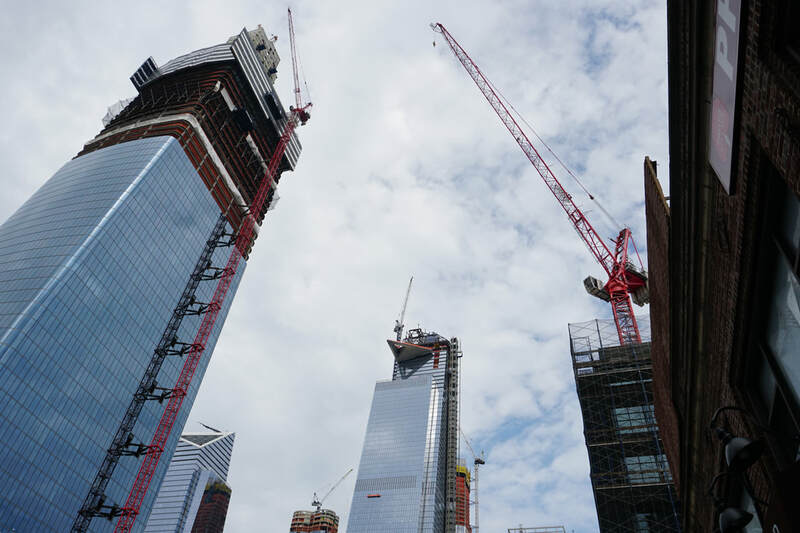 We wander through construction in Brooklyn, take the subway to Manhattan, walk through construction everywhere in Manhattan and make our first stop of the day. I want to go to B and H Camera store! B and H had been around for many years. The first time I went to NYC they were a very small space with cameras on both walls and in cases. The place was maybe 14 feet wide and 30 foot deep. The neighborhood at the time was kinda sketchy and if you wanted in, they had to buzz you in. Things have changed a bit. B and H had become a massive store, 70k square foot in size . Back in the day it was new and used cameras, now it is everything photgraphic and most things electronic. While I browsed cameras and drones (I didn't buy either), Laurie went shopping for a set of Bluetooth earbuds. She bought a great pair which she is very happy with. ​I got to put hands on a couple of photo items I have been considering and to actually look at several of the drones I am interested in. While shopping online is easy, actually picking it up and handling it makes it a lot easier to make decisions. While I didn't buy a drone, actually handling and looking at them made me change which one I intend to buy when I do. We leave B and H with plans to meet Janet. She is an editor at Reuters in NYC and she and her husband Lee were our next door neighbors in Wilmington, NC back in the 90's. Lee used to sit on the front porch and enjoy a cigarette or two as Janet wouldn't let him smoke inside. Heather would come over and talk with Lee as he smoked. According to Lee he enjoyed the "stream of consciousness" unleashed by Heather. These small conversations, according to Lee , were why they decided to have kids. We have a great lunch at a VERY authentic Thai restaurant in Hell's Kitchen, complete with Larb salad. I haven't had Larb salad before but it was quite tasty. Fresh vegetables, citrus, a lot of different flavors. It was great. And it was great to see Janet. Next time we hope Lee will be able to join us. We walk with Janet and drop her off at her office. We walk a few blocks over and go to a bar we saw called "Rudy's". Apparently, it has been there since the 1930's and has been frequented by everyone.....from bums to the famous. Norman Mailer , Sinatra, all matter of people. Beers are cheap for NYC at around 5 bucks for good microbrews, or 3 bucks for domestics. 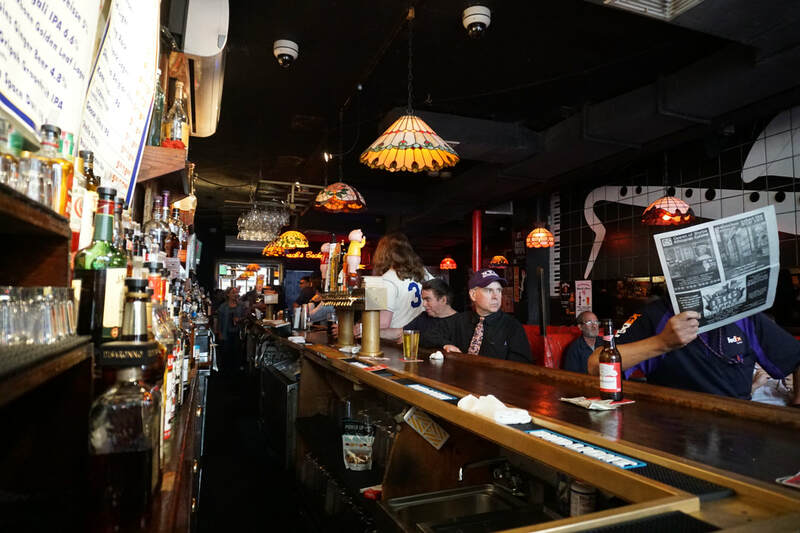 If you're buying beer, the bar will give you free hotdogs. No one is brave enough to ask what the hotdogs are made of. You don't look a gift horse in the mouth....especially in Hell's Kitchen. Eat 'em and keep your mouth shut! We watch the crowd in Rudy's. They encompass everyone from Fed Ex delivery guys to stock brokers, to NYU professors. It is a real equal opportunity joint. The booths are red leather, patched over the years with red duct tape. At some point, it reached a tipping point and the booths are mostly duct tape now, with the occasional glimpse of red leather. The patrons don't even seem to notice....or care for that matter. We enjoy our beer in this NYC landmark and when finished we head toward the subway. We walk through a neighborhood and are passed by multiple fire engines and police vehicles. They are converging on a playground and when we pass the playground we stop to see what is going on. It seems a kid , around 12, decided to get into one of the "bucket" type swings meant for babies. I took a photo and Laurie immediately chastised me and says: "What if that kid is a special needs kid? What if he is hurt?" I told her I wouldn't share the photo on the blog until we knew for sure. And if we didn't find out I wouldn't use it. The fire department and police cut the chains on the swing and put it on the ground. They brought out an air grinder and cut the swing off the kid. Ten minutes later, the verdict was in. When the swing was fully cut off the kid bolted and ran into the street and fled. Verdict? Not special needs, not hurt, dumb as a rock. The locals join us in a shaking your head moment as we watch this kid streak out of the playground and run like a madman to somewhere else. We tell one of the locals about a kid in Heather's kindergarten class that got his head hung in a desk the first day and they fire department had to come free him. He was known as the head in the desk kid for the rest of his school years. We wander through a small antique shop and check out things they have. Old post cards, art deco stuff, a fun place to browse. After that, we get back on track and walk towards the subway. Cutting one of the less intelligent kids on the playground out of an infant swing. I hope his buddies remind him often. We take the subway to Chinatown and start wandering the area. We check out a few small shops and wind up in a pop up artists market. I play a game of foosball with a local kid (I'm REALLY rusty) and we start our wandering again. We have dinner plans but that's 3 hours away. But it's been quite a few hours from lunch, and I want a snack. We're in Chinatown so chances are pretty good we are going to one of my "every time in NYC" places. Lee and Janet introduced us to the place a few years ago, and I simply love it. We're headed to Nom Wah, a tea and dumplings joint up an alley . The decor is straight out of the 1920's, and the food is divine. Laurie has ginger tea and we share several small orders of different types of dumplings. They're a tasty snack and nobody does them better than Nom Wah. We joke that we "eat our way through NYC" when we visit. This turns out to be less of a joke on every visit. There are so many exotic and wonderful things to eat there it is difficult to stay on a diet. We allow ourselves some lattitude as we are on vacation and we're allowing ourselves to live a little. This aside, we decide that the best way to burn off calories is exercise. We make the decision to walk back to Brooklyn, taking the Manhattan Bridge from Chinatown to the DUMBO (Down Under the Manhattan Bridge Overpass) area of Brooklyn. The Manhattan bridge isn't as flashy as the Brooklyn Bridge. No souvenir vendors or throngs of tourists. Just locals walking to their destinations. The walkway isn't fancy or elevated like on the Brooklyn bridge, but someone has cut small holes in the fence along the way to accommodate photographers. We take some great photos! 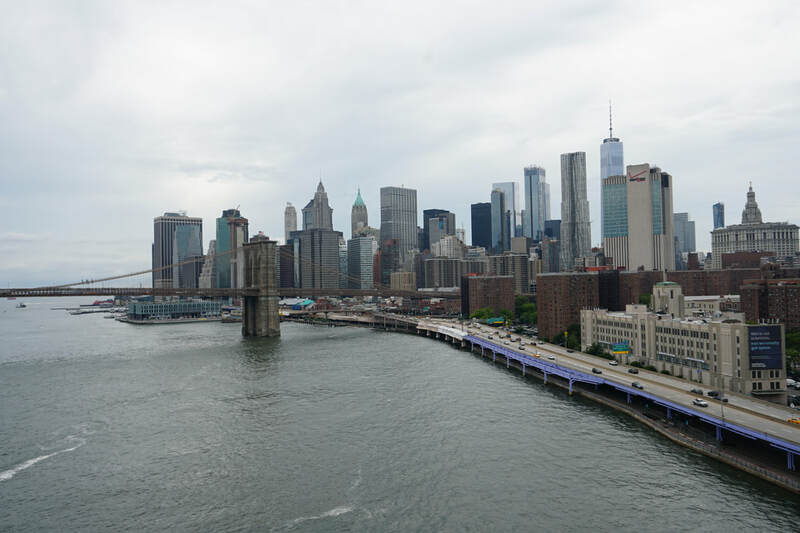 Manhattan skyline and the Brooklyn Bridge, photographed from the pedestrian walkway on the Manhattan Bridge. 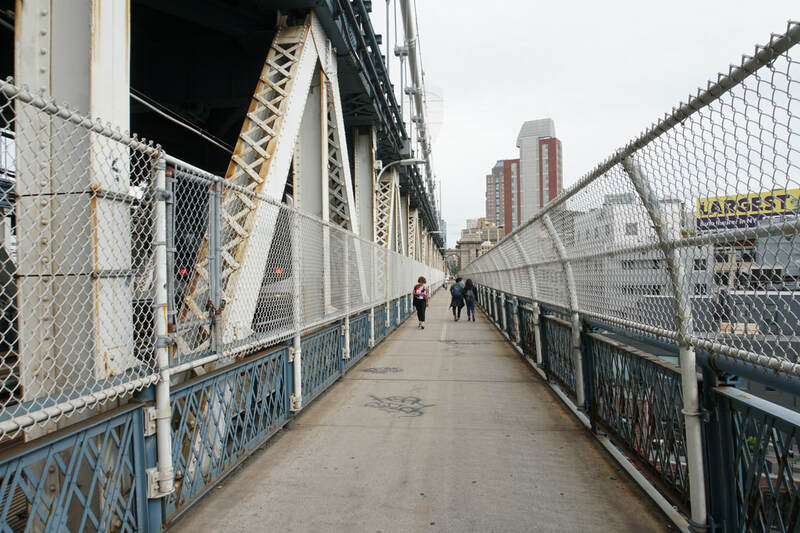 Walkway on the Manhattan Bridge, from Manhattan to Brooklyn. We try to walk a lot while in the city. This serves a couple of purposes. The city is an interesting place and the very best way to see it is on foot. You have time to stop and see things and can look at things at your leisure. It is also a means of exercise. Maybe it's just me but I don't feel as bad about enjoying fun foods if I'm walking around ten or more miles a day. And yes, it's easy to walk that far in a day. There are so many visually stimulating things going on you don't get bored. Before you know it you've walked ten miles. Walking also "paces" your adventures. I see lots of people dashing from place to place on vacation. They try to see a lot of places rather than just enjoying and learning about the place they are at. It forces you to slow down and take it all in. We walk through Brooklyn, taking in the sights. Brooklyn, in the area we are in, is very nice. Rooftop bars, parks, nice condos and and stores dot our path. We head towards a restaurant called "Jack the Horse", a neighborhood place. We wouldn't have known about it had we not been meeting locals there for dinner! We meet a friend from Laurie's college days and his family. Tim is an elementary school teacher in Brooklyn and he and his wife Susan and their daughter Lilly have lived in Brooklyn a very long time. As we talk during the evening, they tell us how Brooklyn has changed, cleaned up, and evolved over the years. As I've said in the past, I really like Brooklyn. 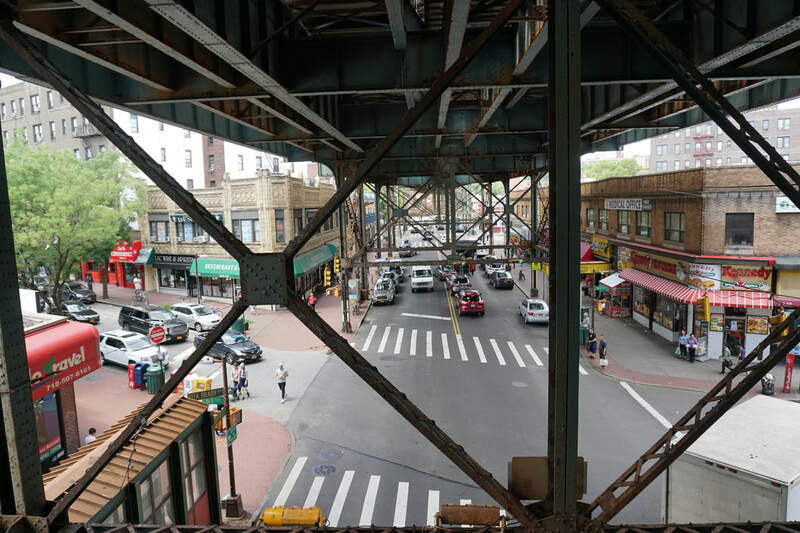 It's a "real" neighborhood and the people in it feel more connected to the neighborhoods than they do in Manhattan. It just feels more genuine. Tim and Susan take us for a walk along the waterfront and tell us how it has evolved. The docks were covered in warehouses and the area was more of a working waterfront. Now the docks have been repurposed. There is a skating rink, basketball courts, soccer fields, ice cream stands, and they're working on a garden on one of the docks. 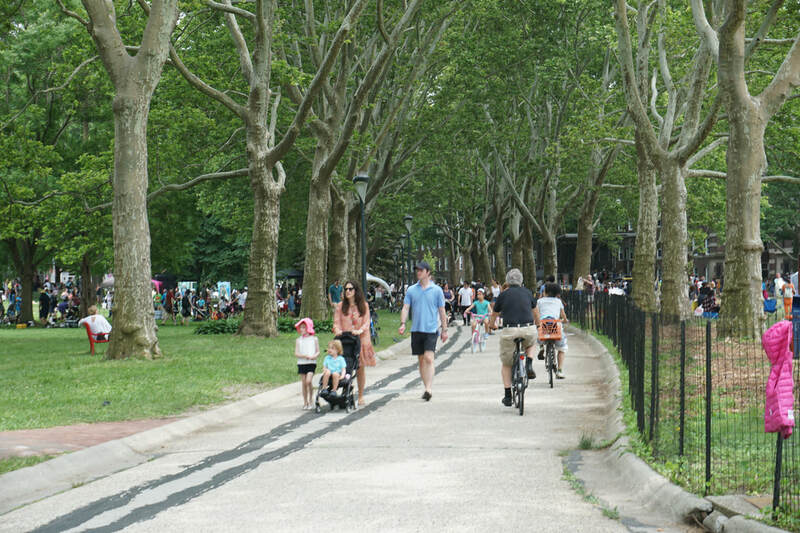 The area is covered with families having cookouts and picnics, people jogging, kids playing sports, and Brooklynites enjoying the evening. We had ice cream and watched the sun set on Manhattan , across the river. It was an incredibly pleasant evening. I told Tim I wanted to take a few city skyline shots after dark. He knew EXACTLY where to take me. The result is the background photo on the blog header, as well as several other shots. Tim was kind enough to drop us off at our hotel after our wonderful evening together. It was still fairly early so we decided to go to a place we have been to on previous NYC trips. We head to Diamante's Cigar Lounge. Diamante's is owned by a guy that is a well known sports and boxing announcer and Brooklyn native. The place has been there since 2009 and anyone can come in and hang out. It's old school , leather furniture, dark wood, sports on the TV's. Tonight, we hung out and talked for quite a while with Leah, a hospital administrator and Natalie, the manager of Diamante's. We talked about travel, visiting NYC, and our experiences meeting new people in new places. 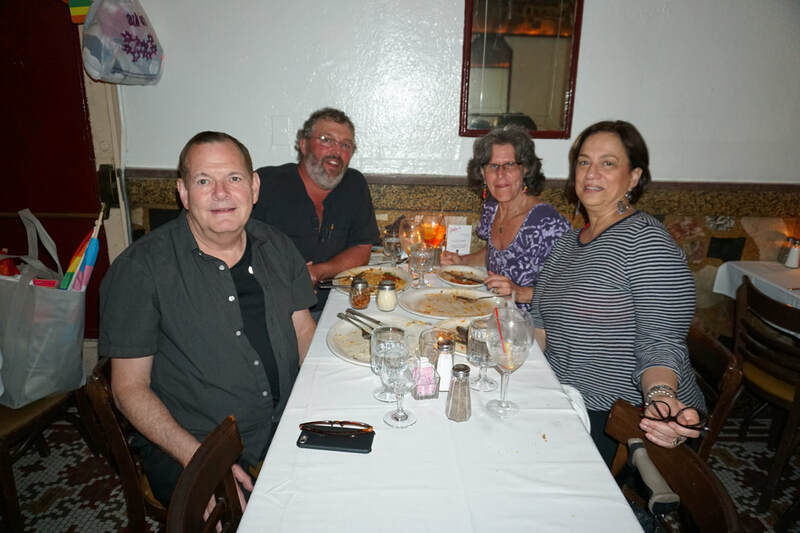 Like most of the people we meet when we travel, we truly enjoyed meeting them and our visit to Diamante's. Now we head back to the hotel and bed. Today is Laurie's Birthday!!! And we're starting out by having brunch with Bruce and Maria! We meet at the Atlantic Grille, a very nice restaurant near Bruce and Maria's apartment. We have a wonderful meal and like most of our NYC meals so far....we probably eat too much. But it's Laurie's birthday so she is allowed the indulgence. ​After our great brunch, Bruce, Maria, and Laurie head off to the Museum of Modern Art. She loved it and enjoyed sharing it with people who truly appreciate art as she does. She raved about the exhibit, told me how much she enjoyed it, and also said "you would have hated it". She's probably right....but I was elsewhere, wandering as I do. I'm glad she is having a good day. I decided to check out a few NYC landmarks that I haven't seen before. First stop was Central Park, just a block or two from where we had brunch. As many times as Laurie has taken me to New York, I have never set foot in one of it's most iconic places. Today I'll mark this one off the list. I duck in one of the entrances and walk right by the famous Tavern on the Green. 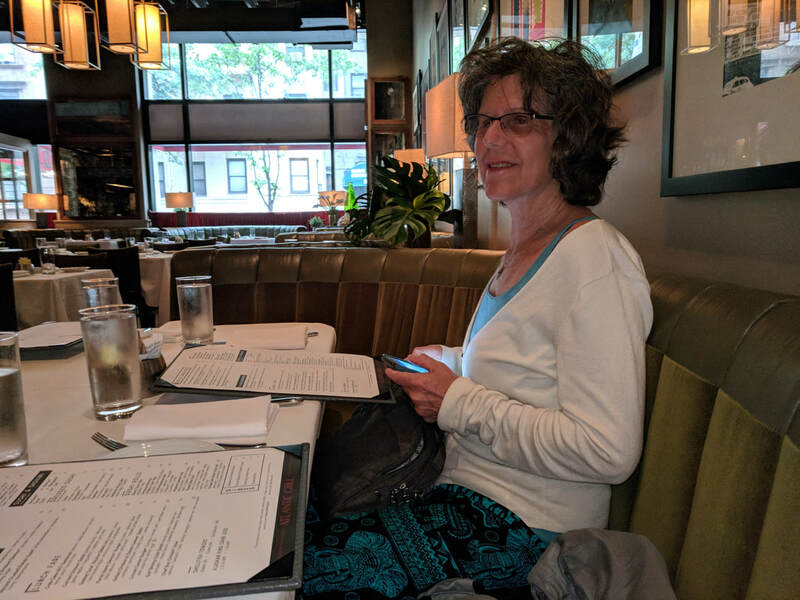 I read the menu and am surprised to find out that the brunch menu includes a southern dish that Laurie has spoke poorly of since I first introduced her to it in 1987. Tavern on the Green serves biscuits and gravy. I immediately text this to Laurie to show her the error of her ways and that all the cool NYC people eat biscuits and gravy. After my Central Park walk, I take the subway downtown. Another NYC landmark I haven't seen is the famous Staten Island Ferry. I enter the terminal and board the boat for a free harbor ride in NYC. 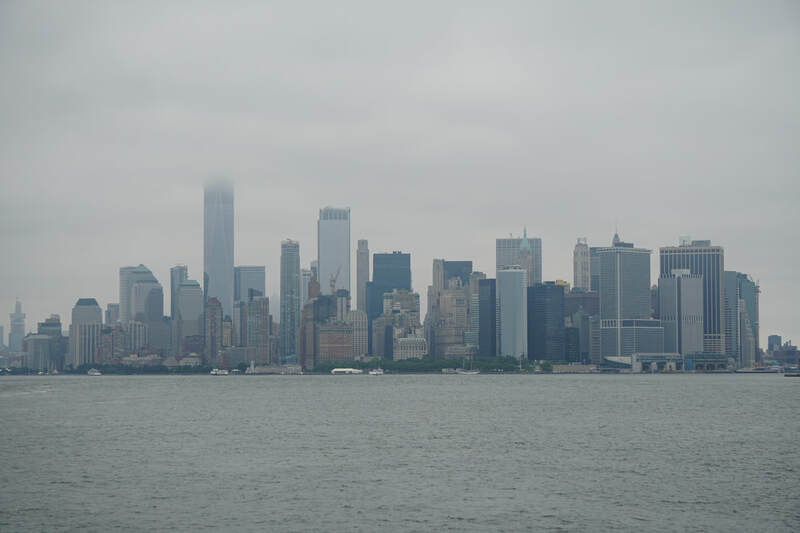 The ferry leaves the southern tip of Manhattan and passes Governor's Island, the Statue of Liberty, Ellis Island, and all the harbor landmarks. The price beats all the other harbor tours in NYC.......it's free! 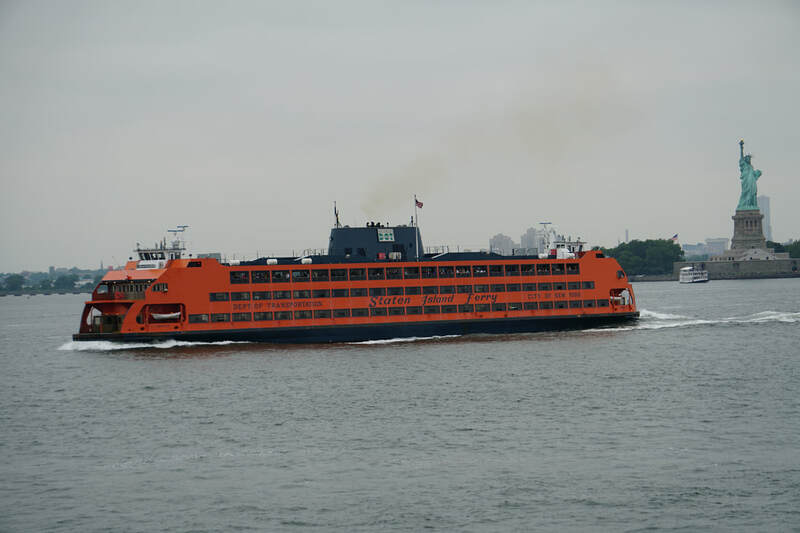 The Staten Island ferry doesn't charge, and runs 24 hours a day. I did find out that you can't stay on the boat and take it back. They make you disembark and you can take the next boat back in about 30 minutes. There is a good pizza restaurant in the terminal, a bar, a store, and a Dairy Queen. I take the ferry back and begin to walk to the restaurant I will be meeting everyone at for Laurie's birthday dinner. I love walking in NYC. There are always interesting things to see and it seems like you discover new things constantly. The walk is not short, somewhere around 3 miles. But as everyone knows, it's a short walk for me. I would guess that I walked around 7 miles total today, which still isn't that far. But I need to walk so I can eat all that wonderful food in NYC! I arrive very early at the restaurant , so I walk another mile or so, and return a few minutes before our reservation time. Everyone arrives and Bruce, Maria, Laurie and I have a wonderful dinner at a fantastic Lebanese restaurant. It was very nice end to a great birthday for my wonderful wife. We rise fairly early for NYC as we have to be in Manhattan at 9:30 a.m. We hop the subway and head to Grand Central Station to meet Nancy! 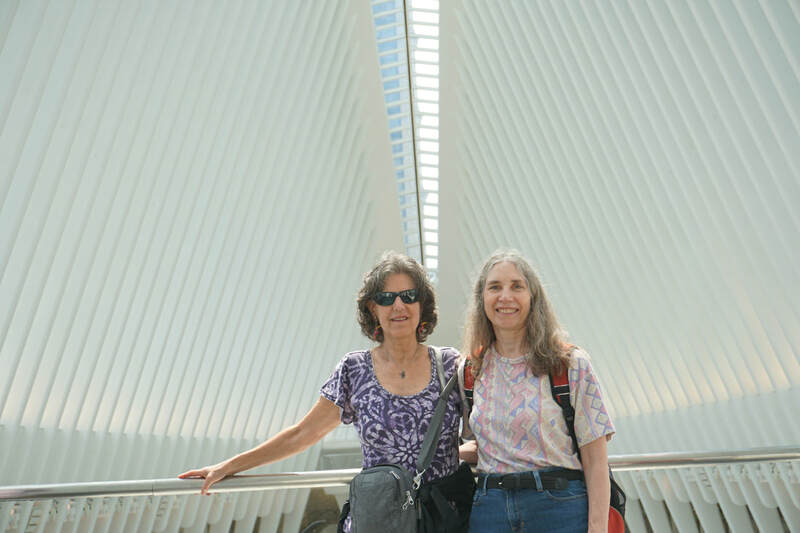 Laurie and Nancy have been friends since they were seven. They lost track of each other for a while but I tracked Nancy down about 25 years ago and they have stayed in touch ever since. Nancy came to the city last year and joined us and she took the train down today to spend the day with us. Laurie always loves to see Nancy. 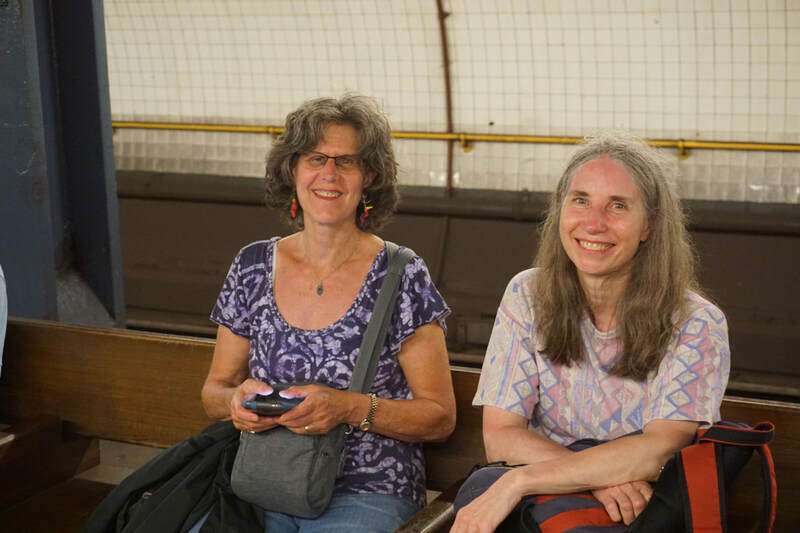 We find Nancy at Grand Central Station and we board the subway. We get off in the financial district and find a place for breakfast. We have a bit to eat, catch up, and plan our day. We were in the financial district and it's hard to miss one of the major landmarks. 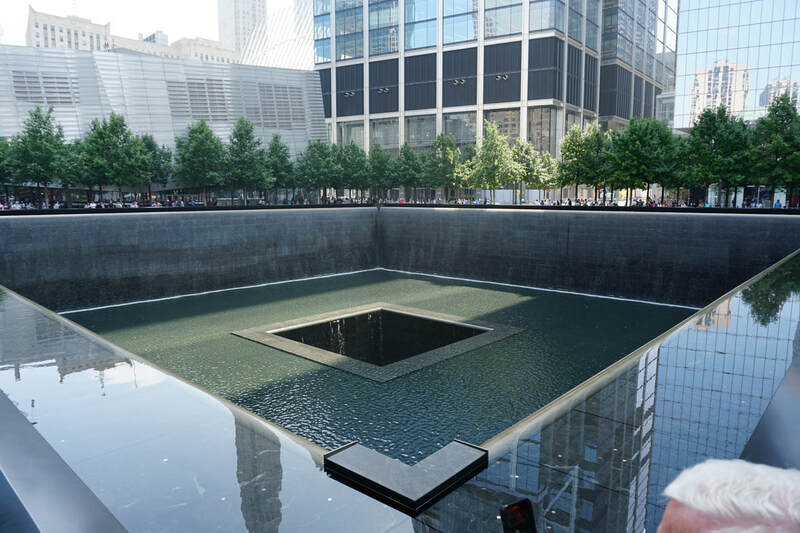 This is where the 911 memorial is located. It is easy to spot as the new Freedom Tower is very distinctive and easy to spot. You just walk towards it to find it. The memorial is quite tasteful. It is also quite somber. The names of those lost in this tragedy are stencil cut into the metal around the memorial. As they are cut in, the names can be rubbed on a piece of paper. At night, the light from the memorial shines up through the letters in the name. The names , being cut in, are open. Loved ones and friends will often put the stem of a flower into the letters on the name of those they lost. It is a sobering reminder of where you are and what happened here. 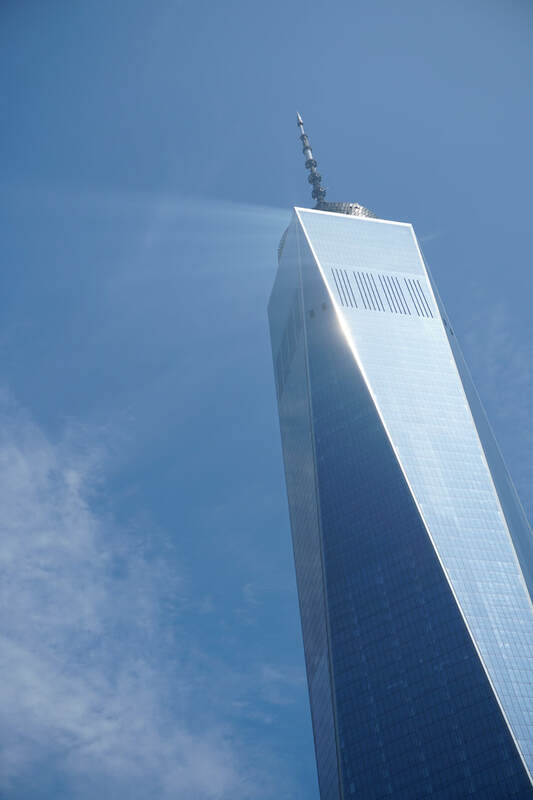 The freedom tower reflects the light in distinct ways. With the high humidity and haze in the area, the sun hits the tower and shines into the haze. It looks....surreal. It's like a lighthouse in the daytime. The footprint of the World Trade Center buildings have been resurrected as fountains, rolling in on themselves and down to the next level. It is simple, stark, and thought provoking. For NYC it is also a fairly quiet place. Quiet is unusual in NYC, and when you find it, you notice. It is quiet enough to hear the water flow and individual voices speak. This is unusual for NYC. We talked to Maria about it later in the day. She said that it was so different in the city after 911. She was a social worker at a hospital in Manhattan . She was assigned to do triage and deal with the emotional issues that the incoming patients would be experiencing. She said "we waited and waited....but no one ever came." Maria talked about being in Manhattan after 911 and how the city was silent. She said the city was quiet for weeks after 911, no car horns, no yelling on the street. The city was in shock. Maria said she had not been to the site and didn't want to go. She asked why we went and I told her it was to bear witness. We did the same at Dachau, and we did the same at the Berlin Christmas Market just days after the terroist attack. Laurie and I have felt the need to bear witness to evil so we and those we tell will remember that evil exists. Hopefully this witness will breed vigilance and teach others not to be afraid. One of the positives in writing about something days later is that you've had time to digest and reflect on your day and interactions. In retrospect, even without a visit to the site, Maria bore witness in a much more intense manner than ours. She was there. It occurred all around her. She sat and waited, to help those that never came. She, like millions of others, went on with their lives in a city with a huge open wound. There are few ways to bear witness that are more intense than this. She doesn't want to visit the site.....nor does she need to. She bears witness on her own terms.......as does everyone else in New York City who was there. We skip the museum at the site, although I have heard it is incredibly well done. I've also heard several people say they couldn't handle the whole museum and they had to leave before going all the way through. We all deal with things like this in our own way and we all have our own levels of what we can handle. Use your own judgement. As we walk away from the site, another structure is right beside the plaza. It is unusual, even for NYC. It turns out it is a massive subterranean mall. It is quite a transition from the memorial site. We enter the mall , which has an even more impressive interior. 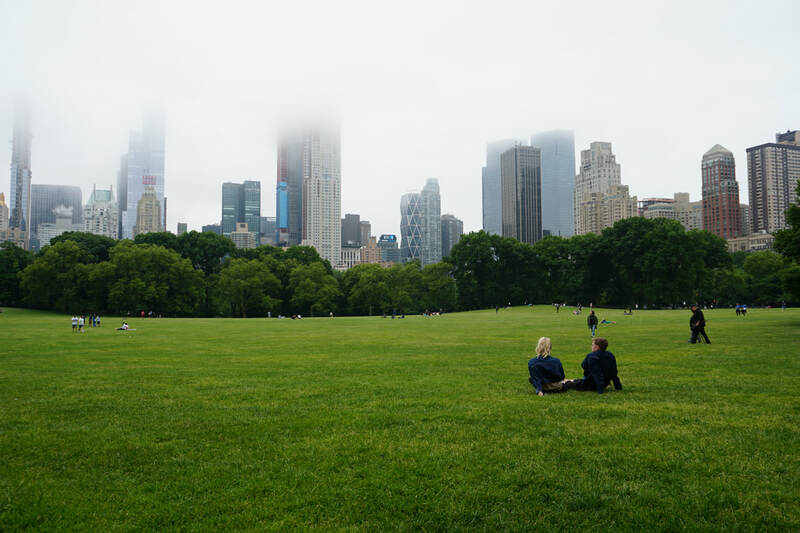 Massive open expanses are rare in NYC as space is at a premium. This is quite a surprise as the entrance is so much smaller than what is inside. The open space and appearance reminds me of Hallgrímskirkja , a huge concrete church in Reykjavik, Iceland. We visited this church several years ago and the resemblance is quite similar. Large, open spaces punctuated with what I would call "ribs". It's very distinct. It also has a public restroom. When in NYC, my mind switches to "New York mode". When in that mode, you always take advantage of a bathroom when you find it. The discomfort of having to find a bathroom while having to walk long distances to reach it is quite unpleasant. Consequently, we use the restroom before we move on to our next destination. We exit the mall and begin to head south towards the battery. In the past Laurie has told me that the financial district was a ghost town at night and on the weekends. This is apparently no longer the case. People are everywhere, things are open, there are lots of restaurants, and it is very different than it used to be. Street performance, or "busking" is common in NYC. As I've pointed out in previous blogs, they're not beggars. They are performers who are working for tips. Their abilities run the gamut but NYC tends to draw good ones, kind of like Nashville. They are often amazingly good, and to busk in the NYC subway you actually have to audition and be judged good enough to play there. I've seen amazing performances in the subway, from folk singers, dancers, pianists, vocalists, and any other performance you can think of. 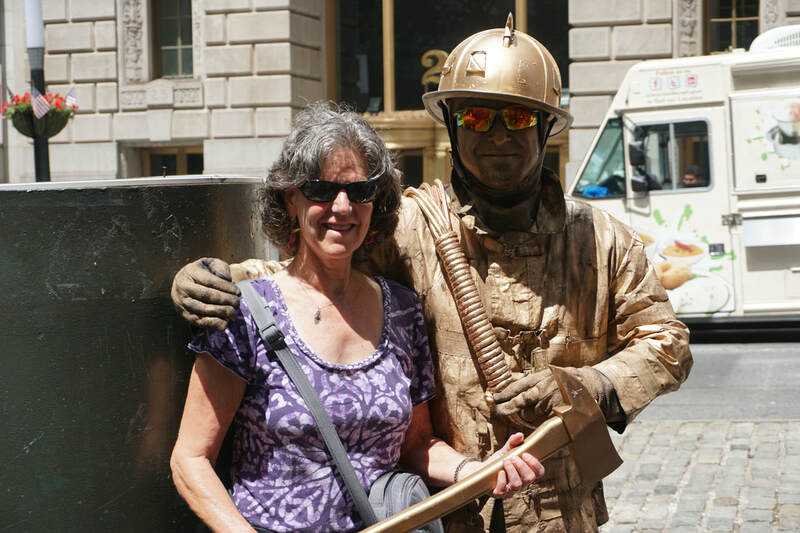 One performer we found cool was a bronze "living statue" of a fireman. He was quite engaging so Laurie put a few bucks in his bucket and they posed for a photo! Laurie and the fireman "statue"
We go by the bull, a famous icon on Wall Street. Even though it is Sunday, it is mobbed with people. You actually can't even get close to it. We bypass it and head further south on to the battery. When at the battery, we embark on our next adventure. 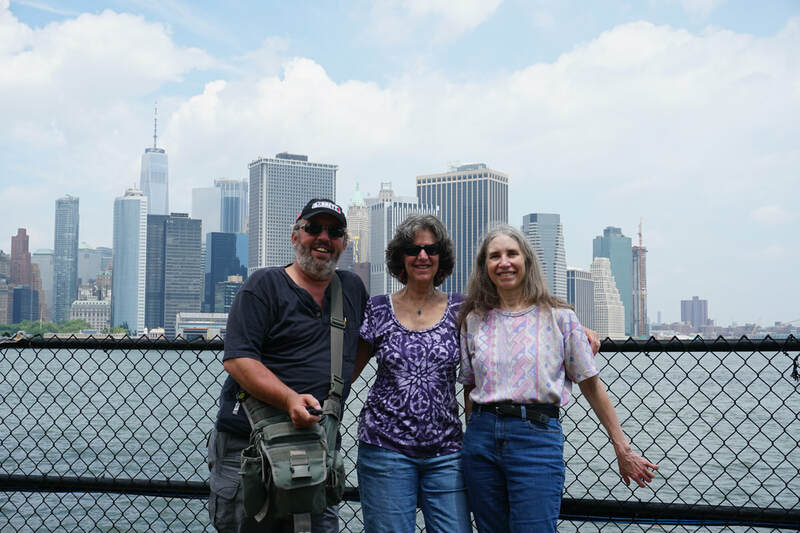 I had planned to go to Governors Island on the day Nancy was here and Laurie thought that would be cool as well. We board the ferry (3 bucks) and head towards the island. 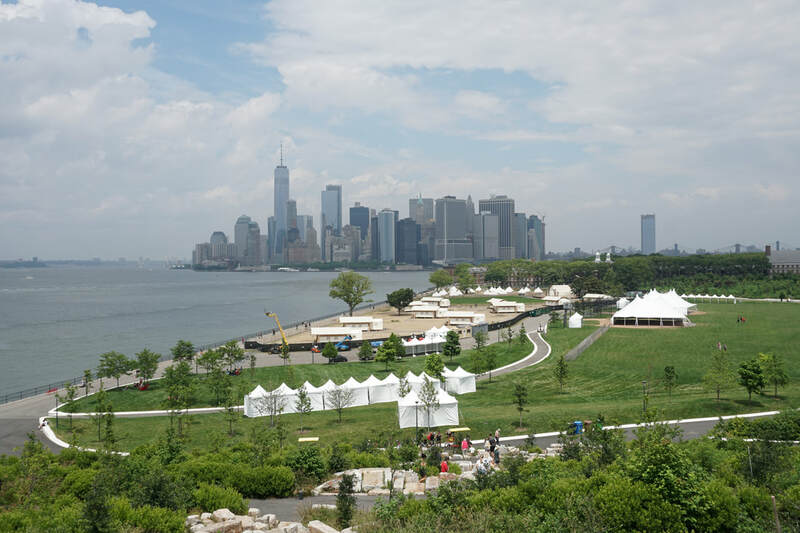 Governors Island is a small island, just minutes off the south tip of Manhattan. It has been a military base since the founding of our country . It was used as a battery to fire on the British during the revolution, and from that point until the 1960's it was an Army base. When the Army pulled out in the 1960's, the island became a U.S. Coast Guard base, the largest in the world. During this time the infrastructure and buildings on the island were upgraded, as they had not seen significant work since the 1930's. The island has been expanded over the years, using spoil (the dirt taken out) from new NYC subway tunnels. Using this spoil, the island was expanded by over 100 acres in the early 1900's. At one point it had a tiny dirt air strip on it. Now, the island is a public park. There are a lot of different things going on, such as a hammock park, festivals, outdoor movies, concerts, restaurants, and even "glamping" (fancy camping) tents. We wander the island with a lot of other people. While there are many people, it isn't crowded. Like Central Park, this is a refuge from the concrete of the city. They cook out, picnic, ride bikes they bring over on the ferry, or they rent bikes. 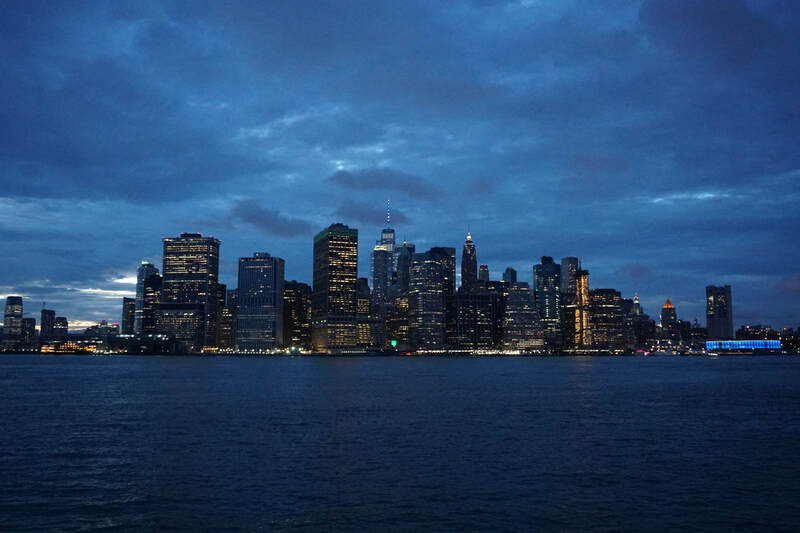 We take in views of Brooklyn, Staten Island, the Statue of Liberty, and of course, Manhattan. We pass an oyster re-population project, which collects oyster shells from restaurants in the city. They take the shells, clean them up, implant them with oyster larvae, and establish new oyster beds with them. All in all......that's pretty cool. They use old, unused buildings on the island to do this project. NYC was the home of a viral video called "Pizza Rat". (click here to see the video) It is basically a video of a rat dragging an entire slice of pizza on a set of subway steps. It's such a huge deal here that even one of the minor league baseball teams in town is named "The Pizza Rats", along with wildly popular hats and shirts with a rat on them. New Yorker's are even proud of their rats! 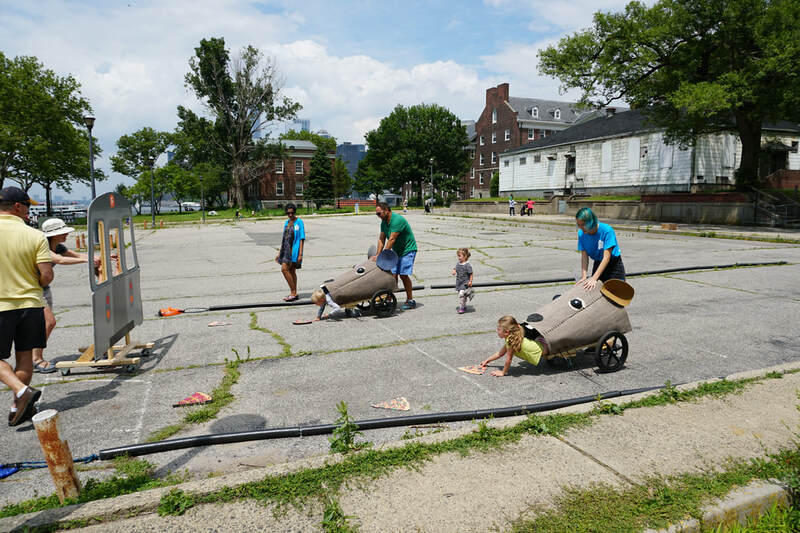 We ran across a fun thing for the kids, where two kids get into carts that look like a rat's head. Another kid pushes a facade of a subway car back and forth. The kids in the rat heads pick up slices of wooden pizza off of the ground. The first kid to pick up all their pizza wins. It was HILARIOUS! Ya gotta give them points for clever. We finish our walk around the island and decide that we're going to take a different ferry than the one we came on. If you take the one back to Manhattan, it is covered by your original fare. But you have to pay for the ferry going to Brooklyn, which is where we're headed. It's not a lot ($2.75) and we get our tickets and sit in the nice air conditioned cabin for the trip. 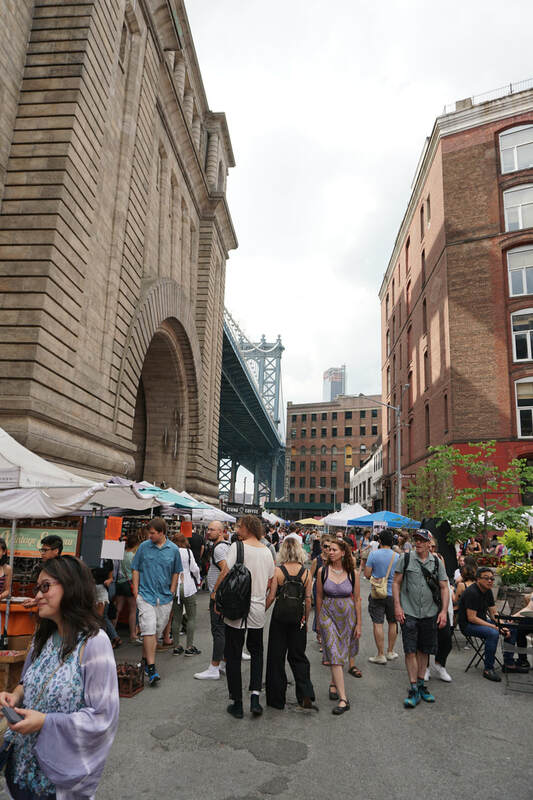 We get off in DUMBO (Down under the Manhattan Bride overpass) and stroll around a bit. We enjoy pizza at a really good pizza joint then walk around and explore. It's rather warm so short breaks to rehydrate and cool off in a/c really help keep us going. Brooklyn has a fairly large flea market right under the bridge. The vendors have everything from donuts to antiques and it is a fun way to kill some time. Brooklyn is less hustle and bustle than Manhattan and personally I like both.....but a break from the constant motion of Manhattan is quite welcome. We check out the wares in the booths that include vintage clothes, old post cards, different foods, furniture, and all matter of flea market fare. The market is well attended and a nice diversion for Brooklynites on a Sunday. If you're in Brooklyn on Sunday and want to get in among the locals, there are few ways better. We stop at a coffee house in an old warehouse down near the river. We have a coffee, wander the waterfront a bit, check out stores in an old warehouse, then decide to head back to Manhattan so Nancy can catch her train. We wait in the subway for the train back to Manhattan, remarking about the amount of sun we got that day. While none of us was sunburned, we did get a bit of color. It was a humid and warm day, but we dodged the rain and had a great day. Nancy lives in Connecticut and took a commuter train down to the city for the day. If I recall correctly, she said the fare was $27 round trip. The northeast does have real rail service and you can drop into the city for the day or an overnight without much effort. You can come down, catch a Broadway show and dinner, and head home in the morning. It's all quite civilized! We are not used to this level of convenience where I am from, or from other cities in the U.S. for that matter. This isn't a good or bad thing, but just a statement of fact. NYC outings like that are possible simply because NYC is a much older city than most others in the U.S. Thus, more train lines and mass transit. It is also much more densely populated than most cities in the U.S. Most of our cities go out, and Manhattan is an island. You can't grow out without going swimming....so they go up. This can be seen in other cities around the world with limited space. But it is uncommon in the states as we have much more room to spread out than in other countries. Everything is nearby. We transfer in the Fulton Street subway station. It seems most of the subway lines in NYC converge here. 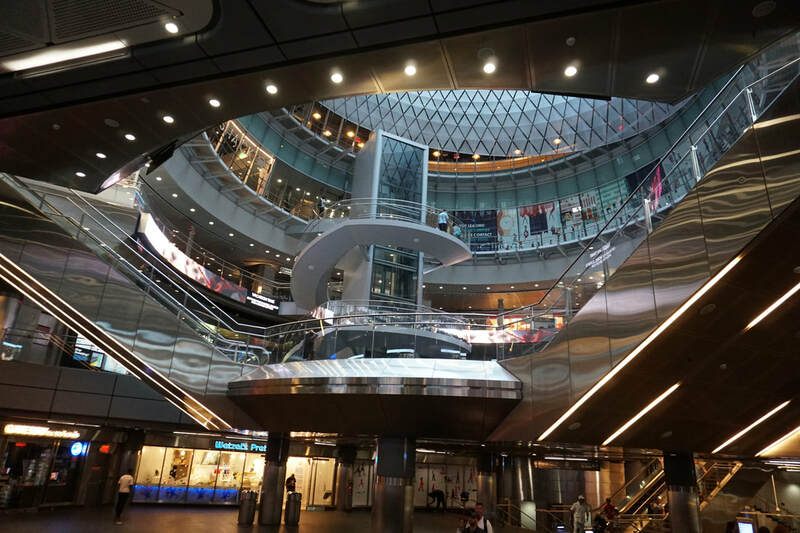 The station itself has a huge shopping center right in the subway station itself as seen above. In addition to going up.....they also go down, as shown with the earlier mentioned mall as well as the Fulton Street station. We arrive at Grand Central Station and see Nancy off at her train. 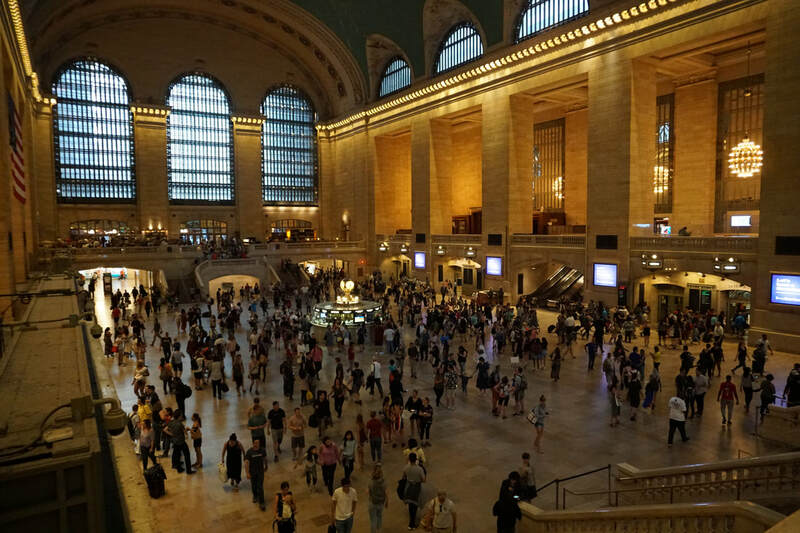 We love train travel, but sadly, most train travel in the U.S. is cost prohibitive or the schedules don't work. We're not like Europe where you can be on a train for 4 hours and go through as many countries. We're more like Russia or China, where you can be on the train for days and still be in that country. Bruce, myself, Laurie, and Maria, at Johns of 12th, my favorite! For our last night in NYC, we meet Maria and Bruce at my all time favorite NYC Italian restaurant, Johns of 12th. As described in my post last year, the place has been open over 110 years. It is always spotless and must have 50 coats of paint on the walls. As always the food is wonderful. We share a bunch of appetizers and I have Chicken Parmesan, my staple dish. Bruce has spinach ravioli, and Laurie and Maria split a shrimp and pasta dish that looked simply wonderful. Yeah, it's touristy, yeah, it's crowded, even at midnight when this photo was taken. 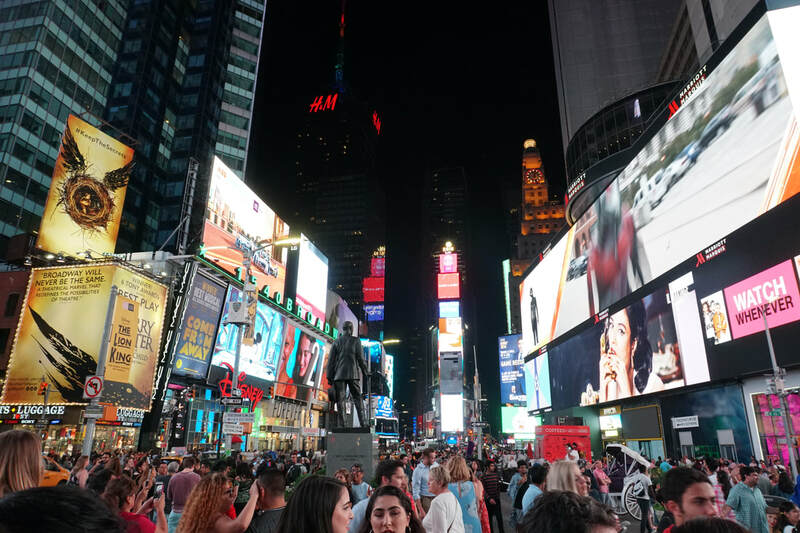 I have the new camera and I wanted to see how it would do at night in Times Square. Verdict is in and i think it's pretty good! Times square had thousands of people there at Midnight. It is so different than it used to be. We get a few quick shots and get on the subway back to Brooklyn. Today is travel day, we are headed home. We rise, and go to Junior's diner (the place we went the first night) for brunch. It seems we have gone full circle here, both starting and finishing at Junior's. There are worse places. I have a hot pastrami, which was a wonderful meal! I don't remember what Laurie had, but it was equally decadent and equally delicious I'm sure. We're in no hurry as our flight doesn't leave until 5 p.m. so we plan on taking our time to get to the airport. I have a green one and Laurie has a black one. They have Molle system straps on them for attachment of any type of Molle gear. 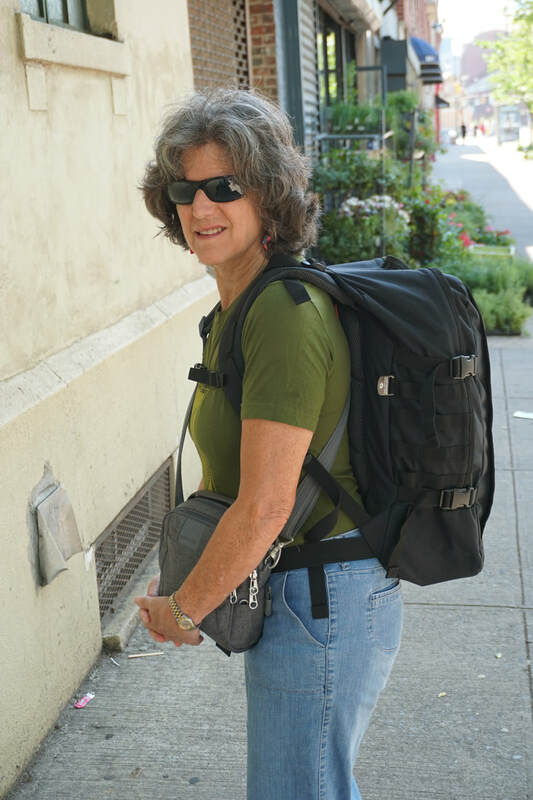 They have a capacity of 44 liters and have several zippered pockets, a padded laptop pocket inside the bag, and a large main compartment. They hold a ton. The bags also have "load lifter " straps which are heavily padded. These help you position the pack where it is easiest to carry. It has a cross chest strap and a belt strap to keep it stable and a padded back as well. They're quite comfortable to carry. The very best thing is that all Cabinzero bags are "carry-on" size. They meet the carry-on requirements for all airlines world wide. We carried everything for 5 nights as well as laptops and camera gear. All we carried was our Cabinzero pack and Laurie carried a purse and I carried a camera bag. Clothes, toiletries, chargers, everything we need. While we carry a bigger pack for winter travel, due to the need for heavier clothes, warm weather allows us to travel with this small pack. We could easily have done a full week with this setup. To quote Cesare Pavese , an Italian poet, "If you wish to travel far and fast, travel light." That's wisdom. We are flying out of Laguardia, and not JFK where we arrived. This isn't a big deal as we have made the trip to Laguardia from Brooklyn before. We take the crosstown subway and transfer to another train to Woodside Queens, the neighborhood where Laurie's grandmother lived and her dad spent a large part of his life. We arrive early to Woodside so we walk a bit. We go up the main street maybe 3/4 of a mile. There are a large number of ethnic restaurants in the area with VERY interesting offerings. Laurie commented that we should come back there to eat on our next NYC trip, and if that's what she wants...count me in! We enjoy our last decadence, having mango cake at a Filipino bakery. Wow. I just LOVED it! A Filipino girl asked me how I liked it and I told her I love baked goods from MANY cultures.....and yes, the mango cake was awesome! We take the airport express bus to the airport. We stop at the first terminal and a yound Indian couple board the bus. We don't get off until the next terminal and we are chatting with them. I asked them if they had just arrived in town and they had. I pulled our 7 day metrocards out of my pocket and gave the cards to them. I told them there were two days left on the card and they could have them. They were quite appreciative. We clear security and TSA precheck is a bit more crowded than Nashville. We have one last beer in the airport (at a scandalous ten dollars each) and board our plane home. We arrive Nashville without problem. The car parking people pick us up and shuttle us back to our offsite parking (www.executivetravelandparking.com). As always, they have our car running, a receipt on the seat, and the a/c has been running so the car is cool in such hot weather. I do so admire a company that takes good care of their customers. If you're flying out of Nashville and need a place to park, they're fantastic! Laurie wanted to go to London for her birthday, and we found out that it took three times the frequent flyer points to go in summer than when we normally travel at Christmas. She opted for NYC instead and it turned out so well. We saw so many friends and had such great experiences. It never gets boring in NYC. Anytime she wants to go, we'll try to make that happen. I've heard folks here in Tennessee express concern about traveling to NYC. Granted, the first time I went back in the '80's , this was a legitimate issue. Now, not at all. I feel safer in NYC than in many parts of Nashville. Our trip was great, with so many visits with friends , so much great food, and so many adventures. If you 're thinking about going to NYC, just go. It's safe, it's fun, and there is so much to do and see. As always, it was so wonderful to share this adventure with Laurie. She is my perfect travel companion and for me, there is no one I would rather venture out and see the world with. It was her birthday and I'm happy she had such a great time. Until my next trip with my wonderful wife.........plan those trips, and if you have any questions, by all means ask me. Thanks for reading and safe travels.